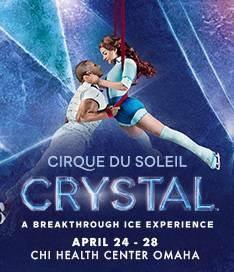 Cirque du Soleil Crystal™ - A Breakthrough Ice Experience will be in Omaha from April 24-28. Watch world-class ice skaters and acrobats claim their new frozen playground with speed and fluidity as they challenge the laws of gravity with never-before-seen acrobatics. A new kind of performance as Cirque du Soleil meets the ice to defy all expectations. Crystal - an exhilarating journey of speed, wonder, and discovery! Tickets available at all Ticketmaster retail ticket center locations, Ticketmaster charge-by-phone 1 (800) 745-3000, online at Ticketmaster.com or at CHI Health Center Omaha Box Office.